The webcast will also highlight new collateral and download information. As you are all well aware not all desktops are the same, especially when you consider VDI desktops compared to cloud-based desktops. To help customers better understand which desktop is best for their end users, Pano Logic's Mike fodor will explore and evaluate different desktop scenarios. Attendees will gain an understanding on when to use Pano System for VDI and when to use Pano System for Cloud. Pano Logic is releasing both Pano System 6.0 and a new product called Pano Virtual Client, which provides for a whole new form of Pano System endpoint. 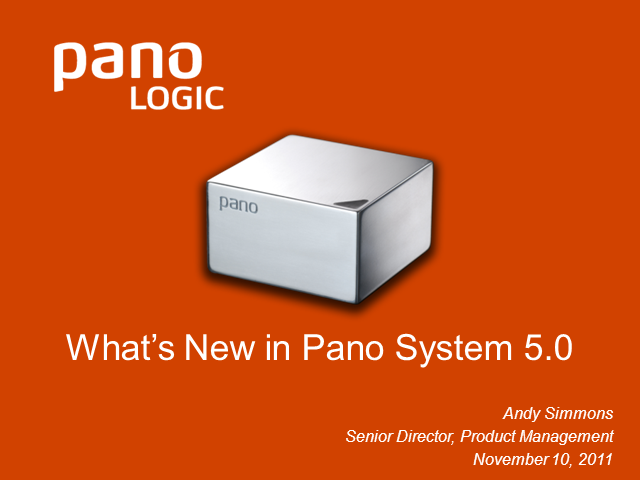 Please join us on May 23rd for an informative webcast where we will paint a high level picture of what’s new in System 6.0 and give you a look at Pano Virtual Client Software. •New Pano Virtual Client software allows you to repurpose PCs and laptops as Pano System endpoints on your LAN. •Pano System 6.0 includes new License Manager for Pano Virtual Client subscription licenses. •Pano Remote can now use RSA SecurID token passcodes for two-factor authentication and increased security. •Improved user experience and support for cloned monitors for use in classrooms and kiosks. •Supports the latest releases from VMware and Citrix XenDesktop alongside continuing support for Microsoft Hyper-V. This webcast will discuss best practices using Pano Logic zero client computing. The webcast will last 30 minutes with a further 15 minutes for Q&A. This joint webcast with 451 Group's Infrastructure Software Analyst Karin Kelley will look at the evolution of VDI and consider the role and importance of protocols in the widespread adoption of desktop virtualization. This webcast will discuss zero client computing and what it means. The webcast will discuss the advantages of zero client computing and illustrate with a variety of case study materials. Pano Logic recently launched Pano Express, a complete, one-step desktop virtualization solution in 3 flavors - HA, SMB and Education. Join this webcast to get details, configurations and pricing. This Webcast will be presented by Dana Loof, EVP at Pano Logic and will provide participants with a high level overview of Pano Logic's Pano System 4.5 release scheduled for 4/20, which includes significant performance enhancements as well as support for XenDesktop 5. There will be time for live Q&A at the end of the webcast. This Webcast will be presented by Dana Loof, EVP at Pano Logic and will provide participants with a high level overview of Pano Logic's major Pano System 4 release, comprising increased hardware functionality and software enhancements. This Webcast will also address the release of 4.1 scheduled for early February, which will provide users with extended support for Citrix XenDesktop, completing the hypervisor trifecta by enabling Pano Logic customers to interoperate with 99% of all VDI deployments including VMware, Hyper-V and now Citrix. This webcast will give you a comprehensive overview of Pano Logic's Desktop Virtualization solution and its ability to interoperate with 99% of VDI deployments including VMware, Citrix and Microsoft. Rachel Chalmers, Research Director, 451 Group, Dana Loof, EVP, Pano Logic, Inc.
Everything you wanted to know about virtual desktop infrastructure (VDI) but were afraid to ask.. Presented by Rachel Chalmers, Research Director at the 451 Group and Dana Loof, EVP Marketing at Pano Logic, this webcast won’t turn you into a thrilling conversationalist at dinner parties (trust us on this one) but it may illicit feelings of smug confidence in front of your IT peer group. 1. Is a virtual desktop deployment right for you? 2. If you decide to deploy, what are the critical initial steps? 3. How do you evaluate your VDI options - what’s right for you? 4. Which platform should you select? 5. What are the key success criteria? At the conclusion of the webcast participants will have a clear understanding of what it means to deploy a virtualized desktop environment and understand some of the areas to consider when making IT investment decisions. Disclaimer: Do not use heavy machinery when discussing VDI. A short video montage where a diverse group of organizations - from a brewery to a medical center - who have deployed desktop virtualization discuss their experiences both in terms of the actual installation of the solution and the day to day user experience.